You always have a chance of a great game when Spanish and German sides clash and these two teams have previously met in a Eurocup semi-final. That was back in 2010 and it was the German side who triumphed by a score of 77-70. They eventually lost the final, to other Spanish opponents, but this is a game that both teams will be keen to win. This is the opening game for Bilbao in the Eurocup this season but they will come into this game with a great deal of confidence. This is because they defeated FC Barcelona Lassa at the weekend on domestic duty. This is the sort of confidence booster that can have a huge impact on any team and one player that will need no encouragement to step things up is Jonathan Tabu. Tabu will be playing against his former team in this game and he’ll be keen to get one over on them while boosting his own team’s chances of progressing beyond this stage. ALBA got their Eurocup campaign off to a decent start with a 88-81 home win against Montakit Fuenlabrada, another Spanish side. Elmedin Kikanovic grabbed 25 points in the win, which is a career high for the player. This means he should come into this game absolutely brimming with confidence and the Germans will be looking to take the game to the hosts in the game. Another big player last week for the Germans was Bogdan Radosavljevic, who provided 12 points in the win. The team from Berlin know that they are always good at home but this is the sort of game where they need to take things up a notch and grab something. While the home team will have plenty of confidence and will be raring to go in the Eurocup, ALBA will look to push them as far as they can. 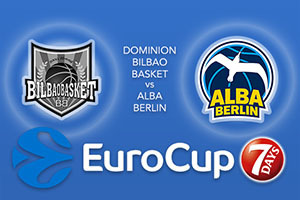 You should look to take ALBA Berlin at +11.5 which is provided at odds of 1.90. For the Over/Under market, you will be looking at going OVER 163.5 which is on offer at odds of 1.90. Bet Now!